What is Minimum Variance Portfolio? Home » Accounting Dictionary » What is Minimum Variance Portfolio? Definition: A minimum variance portfolio indicates a well-diversified portfolio that consists of individually risky assets, which are hedged when traded together, resulting in the lowest possible risk for the rate of expected return. 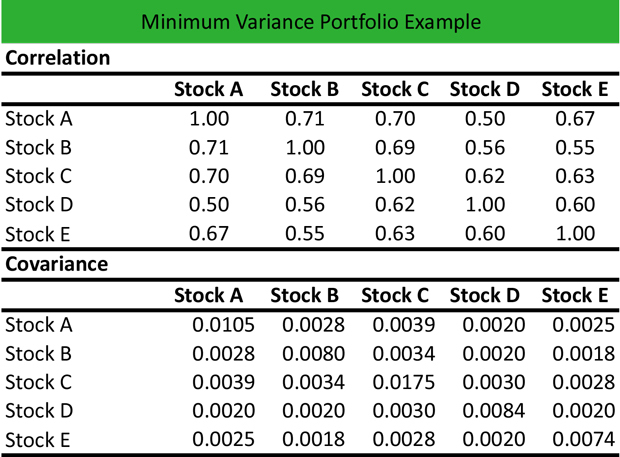 What Does Minimum Variance Portfolio Mean? 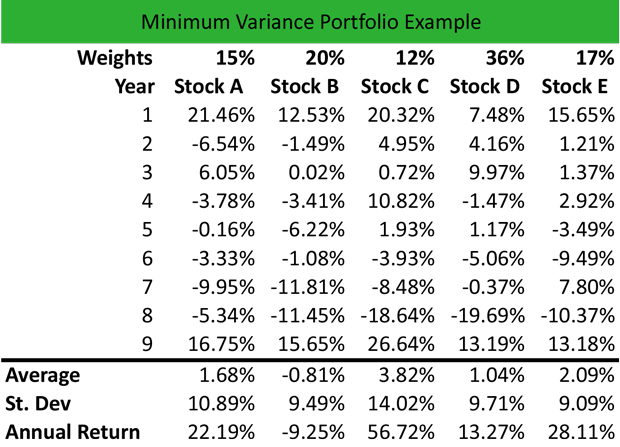 What is the definition of minimum variance portfolio? This leverages the risk of each individual asset with an offsetting investment, thus hedging the total portfolio risk for the level of risk accepted with respect to the expected rate of portfolio return. Put simply each investment in a minimum variance portfolio is risky if traded individually, but when traded in the portfolio the risk is hedged. The term originates from the Markowitz Portfolio Theory, which suggests that volatility can be used to replace risk and, therefore, less volatility variance correlates with less investment risk. Andrew is a financial analyst, and he works at an advisory firm. His manager asked Andrew to calculate the minimum variance portfolio for several risky stocks held by the company’s most prominent customer. Annual return stock A = (1+ Average return)t-1 = (1+1.68%)12-1 = 22.19% and so on for the rest of stocks. Then, he uses the weight of each stock and the covariance to construct the optimized portfolio. The total of weights is equal to 1 (100%). Define Minimum Variance Portfolio: MVP means a diversified portfolio that mitigates risk properly. 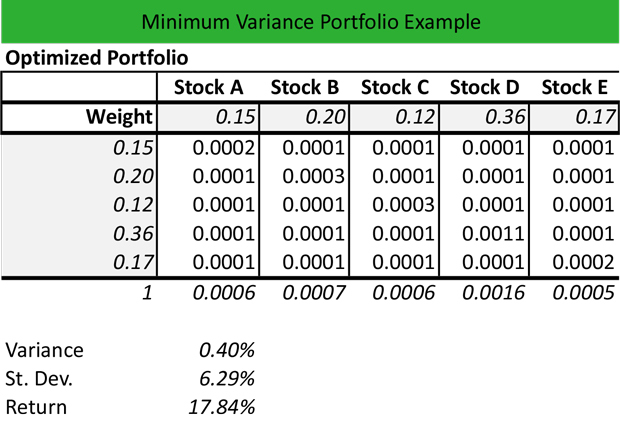 1 What Does Minimum Variance Portfolio Mean?